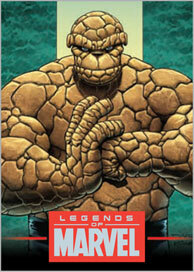 2012 Rittenhouse Legends of Marvel Series 4 continues the string of limited edition mini sets focusing exclusively on the biggest characters of the Marvel Universe. Series 4 shines the spotlight on rock star, Thing, Ghost Rider and his flaming motorcycle, and Ms. Marvel. Each of the three characters has their own mini set of nine cards. 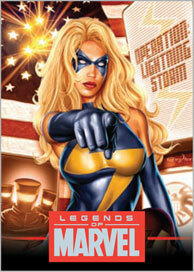 As with past releases, 2012 Rittenhouse Legends of Marvel Series 4 is limited to 1,939 copies. This commemorates the year Marvel first formed. All three characters has one serial-numbered card. Serial numbers match in each set. Collectors who ordered previous series from Rittenhouse also continue to receive the same serial number. New and existing customers also reserve that serial number for any future additions as well. Focusing on artwork, each card is double-sided. 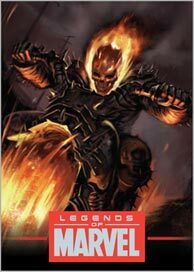 Over their nine individual cards, Thing, Ghost Rider and Ms. Marvel all have 18 total images. Sold separately, Rittenhouse has an album intended to hold all of the Legends of Marvel sets.